To demonstrate our commitment to our customers moving to the Cloud and our partnership with Microsoft, we are excited to announce we’ve achieved the Microsoft Partner Network’s (MPN) Gold Cloud Platform competency. It’s no simple feat and only the top tier of Microsoft partners are able to showcase the in-house expertise, customer success, and performance demands to get to Gold. We know there are Cloud Heroes in every organization and enabling them to achieve their highest level of success as they architect for the digital transformation is part of our mission at Riverbed. Staying aligned and integrated with the top Cloud Alliances will remove the barriers to your infrastructure success. All aspects of our portfolio integrate with Azure to help your move to the cloud. Read more details about our Azure solutions. We have a long-standing relationship with Microsoft optimizing applications and workloads, and we’re now excited to be on the Cloud journey together. 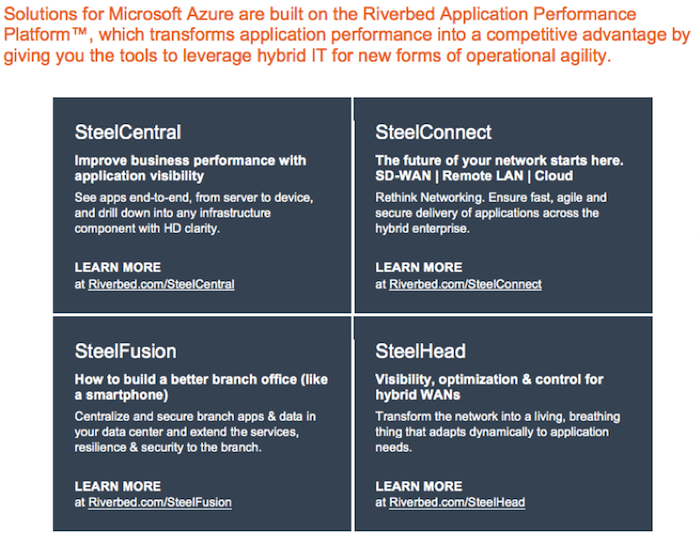 Learn more about our Riverbed + Microsoft partnership here.